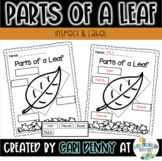 Add to any science or fall unit with this 'parts of a leaf' worksheet! Students will be able to label the stem, vein, and blade of a leaf. Students will love cutting and pasting to label the parts. Just print and use! Enjoy! A quick worksheet to be done independently or as a guided activity. Name the parts of a leaf. Perfect to accompany an art project in the fall. A coloring sheet that shows the basic parts of a leaf. It is meant to be a reinforcement for your lessons on the leaf. 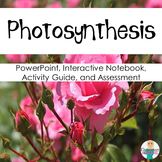 It can be used to illustrate structure or leaf vein patterns; whether for science or visual art exploration. 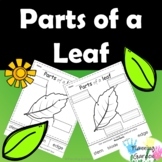 Parts of a leaf activity with modified worksheet and leaf-rubbing instructions, included. 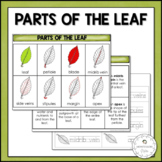 This is a great worksheet for assessment or bulletin board!Let's label the parts of a leaf...includes word bank with picturesPlease let me know how this product works for you by rating and reviewing it.Thank you for your purchase! 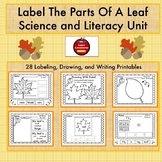 Here is a simple activity to allow your students to label the parts of a leaf. Enjoy! This guide points out the basic parts of a leaf.